Living up to its namesake, the Drift HD Ghost tends to pass by unnoticed. But when you see one in action, it will definitely get your blood pumping. The Drift HD Ghost is a jack of all trades, except it does everything well. It's a great camera for users who like having features, and a great competitor in the action cam market. 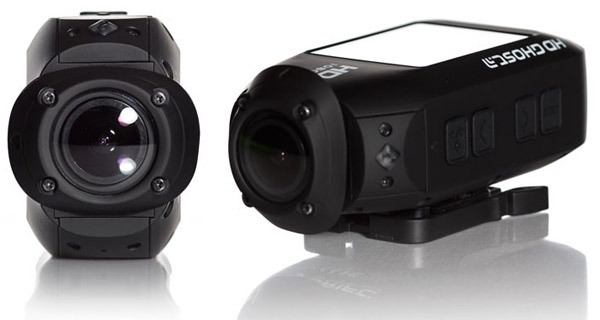 The Drift HD Ghost has more of a traditional camcorder look with a slightly boxier, more rectangular frame than its competitors. Unlike the camcorders of yesteryear, the Ghost fits comfortably in your hand and can be easily mounted to goggles or helmets. One of the most welcome features of the Ghost is its 2-inch built-in LCD screen for viewfinding and reviewing video. This is a huge step up from other action cameras, which often rely on tricks or Wi-Fi to save space. The camera is slightly heavier at 5.9 ounces, but that's reasonable enough to clip to yourself. The top of the camera features four buttons to manage playback and navigate the menu, as well as an LED which indicates recording. The back of the battery contains a mini-USB port, micro-HDMI port, external microphone jack , and a microSD card slot. A waterproof hatch helps keep the electronics dry up to a depth of 3 metres. The Ghost has an impressive range of shooting modes and resolutions. It supports WVGA, 720p, 960p, and 1080p, with respective max frame rates of 120fps, 60fps, 48fps, and 30fps. 30fps 1080p is a little bit of a disappointment for a camera with so many great features, but it's enough to get by for most people. The camera has a field of view (FOV) of 170°, although this can be reduced to 127° or 90° when filming 1080p. The lens can also rotate up to 300°, making it easily mountable from any position. An interesting feature of the Ghost is its Flashback Video Tag/Loop mode, which shoots video in a continuous loop. When the camera catches something you want to save, you simply tag it and the camera up to 5 minutes surrounding the event. This is a great way to create small clips to share with friends or family. The 11 megapixel camera takes decent images with good color and white balance. Sudden brightness and high-contrast environments aren't captured as well as other cameras, and low light environments tend to add noise to the image. The camera can take burst images up to 10fps, as well as time-lapse photos at intervals of 0.5, 1, 2, 3, 5, 10, 30, or 60 seconds. The Ghost has an incredible 3.5 hour expected runtime which almost doubles that of its competitors. It features replaceable battery packs, making it easy to plan for even an entire day of filming. The Ghost doesn't feature instant-on recording, but the ability to continuously record video and review footage on the 2" LCD more than makes up for the small delay in starting it. The Ghost comes with a simple two-button remote that can control not just one camera, but multiple cameras simultaneously. The built-in microphone suffers the same limitations as other action cameras: too much wind will drown out any other noise in the video. Where the Ghost differs is that it lets you adjust the microphone's sensitivity between three different levels, or even plug in your own microphone. Taking advantage of the video loop mode, the Ghost offers a DVR mode designed as a sort of black box feature for your car or motorcycle. As soon as your vehicle starts, the Ghost automatically starts recording a continuous loop of video. Time intervals for each video can be set manually so you can ensure you won't run out of space. The Ghost comes with a wealth of accessories out-of-the-box. In addition to the two-way remote control, you'll find two mounts, a goggle mount, a Velcro strap, a microphone extension cable, a travel case, decals, and a user manual. Drift pulled no punches when it came to giving users what they need, and it shows. The Ghost is one of the more impressive action cameras we've seen. With its remarkable battery life, built-in LCD, huge array of accessories and add-ons, and near limitless features, the Ghost is a great camera for photographers who just want to get up and go. Its video won't win any awards, but its feature set definitely helps it stand out from the crowd.